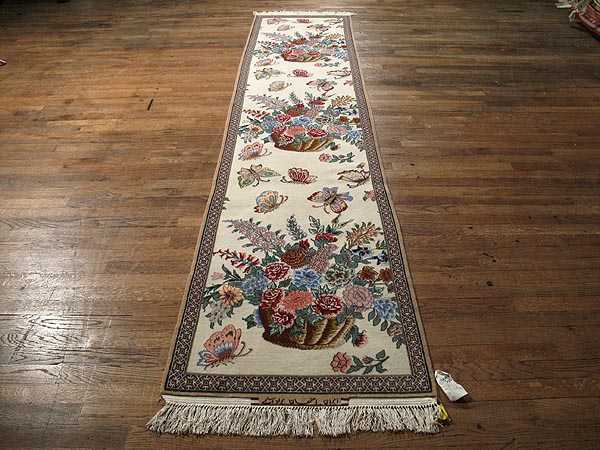 "The image of this runner shape Persian rug is very natural and full of peace. This is because of the ivory background filled with nature inspired floral ornaments. Along with the colorful flowers baskets butterflies are flying filling the field with joyful colors. The flowers from the baskets are especially roses. These flowers are richly decorated and full of natural charm. The colors are vivid, joyful and brightening, naturally completing the Persian rug's view. The Persian rug has an exceptional quality being hand-knotted in wool on a silk foundation."